On my Mediterranean roaming I decided to give the Greek island of Corfu a go. After 10 days packed with adventure, sun, breath-taking beaches, yummy food and big heart people I don’t repent my decision at all. The experience has been complete as Corfu island is one of the few complex destination that offers a bit of everything one expects from a holiday: sun, beach, mountain, forests, urban architecture, the rural charm, water sports. As the plane gets closer and closer to the island one can notice that the island is quite big and its mountains quite high. 64 km from north to south and about 20 km wide are dotted with green peaks that end in breath-taking abysses washed at their feet by the turquoise waters of the Ionian Sea. The front of the small airport of Corfu town is dotted with taxis, though public transport to the town center is available too. The variety of the Corfiot tourist offer makes it easy to choose the style of holiday one is dreaming of. From the all-inclusive, mass tourism to the alternative or wild beaches, you name it, you have it. My go is for that drop of authenticity that you find only exploring off the beaten track. Having said this, I headed in a taxi towards the western coast of the island, just down the hill from the village of Vatos to the Mirtiotissa beach. All the guide books advertise this particular beach as the most beautiful beach in Europe. Seeing some dramatic beaches in Sicily or Ireland, I was a bit reluctant to embrace this statement, but I decided to give it a try. I arrive at my accommodation place just by the time when the sun goes down. Panorama Rooms was the dream accommodation solution. About 300 meters from the steep access to the beach, up on a beautiful terrace covered in wine leaves and 3 types of ripped grapes, immersed in lush vegetation, flowers and jasmine perfume, it offers an amazing view over the bay and sea. The conditions are basic but the beauty of the place, the view, the convenience and the hospitality of Michalis overgo any 5 star hotel in the world. The price of the rooms for 2 people are also great: 25 euros during the high season and 20 euros in low season. There is a kitchen to the side, 2 toilets and a shower. What else would you need in paradise? To complete the scenery, a huge orange disc of the Moon rises above the opposite mountain. Morning wake-up by the sun shining in my room. With some food supply from the nearby village, breakfast is set within a second: fruit+terrace grapes+Greek yogurt+Corfu honey! This is probably the best memory of the holiday. 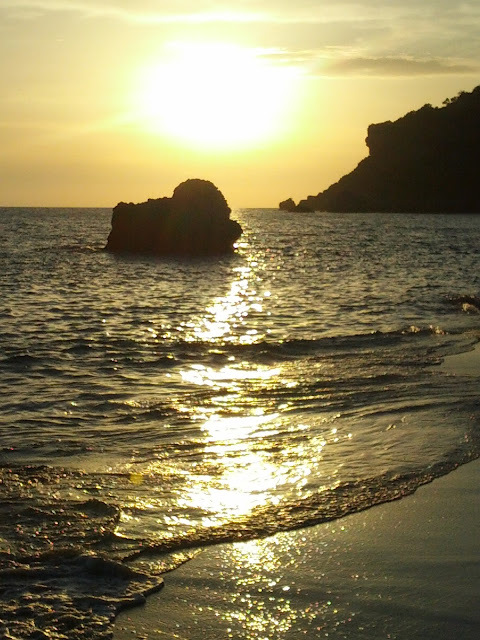 Mirtiotissa beach lies at the feet of a steep cliff making room for the sun shine around 9 am. Great for morning sleepers! Nice sand stretching far in the sea, 2-3 rocks dotting the space, two tiny fresh water streams giving the possibility to wash the sea salt, a beach bar that sells sandwiches, fruit salad with yogurt&honey/ice cream, an ad-hoc honey “shop” and that is all. The beach popular since the hippy years, kept most of its authenticity and attracts both nudists as well as “textile” (swimming suit) sun bathers. Besides its laid back atmosphere one is spared of seeing countless hotels, shops, ambulant sellers. Here you can enjoy the beach, the sun and the unspoiled mountain. 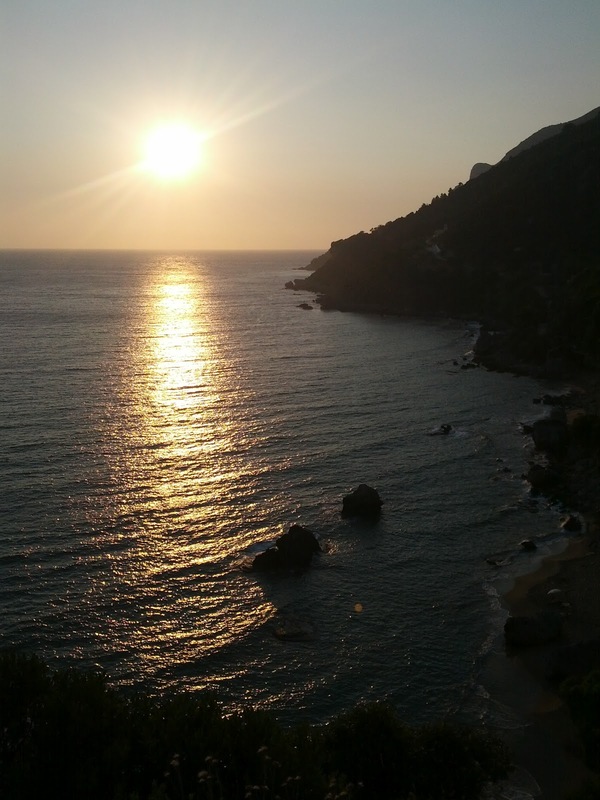 I can’t say that it is THE most beautiful beach in Europe, but I can ensure you that the sun sets are spectacular and it feels that the air and sea are dipped into gold. Half way to the accommodation place there is Elia Restaurant, a family business ran by Spiros – a very nice and chatty chap whose recommendations never went wrong. His grandmother’s cooking makes your day! Moussaka, the meat balls, the vegetable stew, the tsatsiki, the grilled fish or the lamb in the oven are just few mouth watering options, all ending with a platter of fresh water melon on the house. Set by an olive tree orchard it has a nice terrace under an old boat sail where while waiting for the food you can surf the Internet and upload your sunset photos.